Deirdra Kiai’s game Dominique Pamplemousse in “It’s All Over Once the Fat Lady Sings!” has been nominated for four awards at the International Games Festival Awards 2014: Excellence in Narrative, Excellence in Audio, the Nuovo Award and the Seumas McNally Grand Prize. When I saw the nominations, my heart fluttered a little. Deirdra was one of the first people to welcome me to my first Game Developers Conference in 2012, and one of the first developers to ever indulge my journalistic questions. By the time we met again in 2013, Deirdra had just finished developing the stop motion musical detective adventure about a down-on-their-luck private investigator named Dominique Pamplemousse. At GDC 2013, the game had only just been released on iPad after a successful Indiegogo campaign to fund its development. Deirdra hailed me in the corridors and we chatted about it whilst I played; I confessed I thought the game was an amazing culmination of talents: singing, composing, game design and animation. 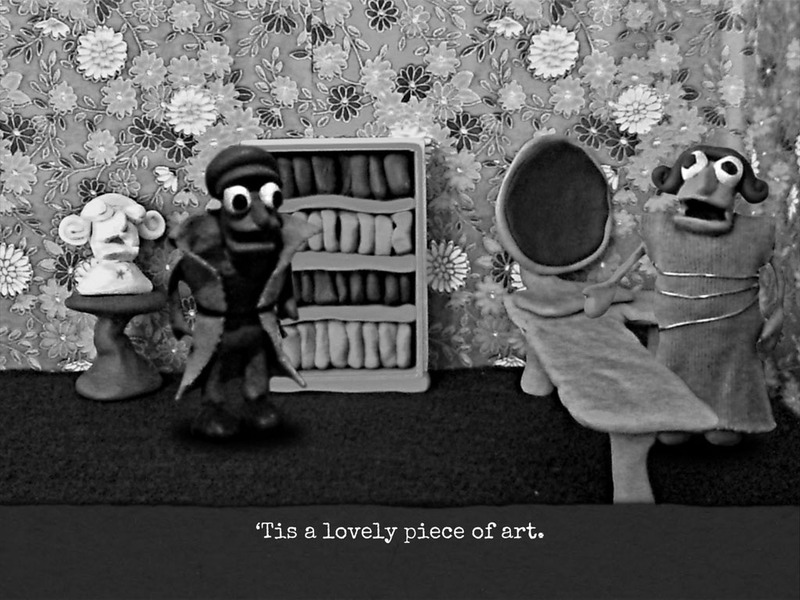 Almost all of the elements of the game, including the stop motion animation, were composed and put together by Deirdra alone. Deirdra even sings all of the parts of the characters and constructed the cute little sets on which the clay characters stand. At the culmination of the game, when the credits roll, Deirdra sings the names of every single person who contributed to Dominique Pamplemousse’s Indiegogo campaign as a thank you. The game’s metronome beat and precise musical loops and verses create a smooth storytelling experience told through song, complete with cute jokes and intense characters. Keeping the timing together so that verses were sung to the correct parts of music was a feat of ingenuity. “My inspiration was a scene in The Curse of Monkey Island where the pirates break out into song,” Deirdra said. (Ron Gilbert hired Deirdra on DeathSpank after Deirdra graduated from university, and he has supported Deirdra’s work ever since.) “The way I create the music is I create pieces that loop, and also pieces that consist of the verse. The loops—I have multiple ones, in a random order in each scene to give it a little bit of variety so it’s not repetitive. It still has to be the same musical chord progression so you can insert the verse at any point. It has to be at a certain time—after a certain number of beats per measure. Usually that’s after four beats or so. There are some where it’s after six beats. This is a song [Deirdra points to the iPad] that’s on seven right now.” Balkan brass band music was also a heavy influence, “which has inspired me to compose in odd time signatures,” Deirdra explains. The music also changes in the game at certain points in the plot, at moments of twists or new information. My favorite character is Prudence, who is an exaggerated opera singer type, and an overbearing mother who is the head of a record company. Dominique Pamplemousse is employed by her to investigate the whereabouts of Casey, who is a singer until recently in her employment. Prudence has an extravagant singing voice and one puzzle involves trying to get the blustering woman to leave her office so that you can search her computer. “[Her singing is] kind of based on the world’s worst opera singer. That was a really fun voice to do,” Deirdra said. There are many twists. None of the people in this story are who they seem. In fact, at the heart of the game Dominique Pamplemousse is that nearly all the characters are struggling with serious identity issues: A daughter has run away from home because she can’t admit that she doesn’t want to live in the shadow of her mother, a pop star struggles to come to grips with his own voice and takes drastic measures, and even minor characters are not who they seem to be. In contrast, Dominique, the central character, who is of ambiguous gender, is very certain of their own identity, and yet in the game characters keep misgendering Dominique, prompting Dominique to correct them. I asked Deirdra about this aspect of Dominique’s characterisation. This too is demonstrated through the narrative of the game: At one point I clicked on a sign that indicates where the restrooms are, and Dominique laments the idea that people must be separated into these two genders. Which one is appropriate to choose when you do not identify as either? All of Dominique Pamplemousse defies expectation and puts most game writing to shame for their repetition of themes. There are a lot of stereotypes employed in traditional hardboiled stories, as Deirdra mentioned, but only the stereotype of the lone raincoated detective was traversed by Deirdra’s narrative. The story is fairly linear, but there are a lot of surprises and a real depth to many of the characters—the humanity and nuance given to them throughout the story constantly impressed me. The biggest choice comes at the end of the story, where you have to make a decision. The black and white visuals, the old-timey music and the operatic cast certainly make for a game that is difficult to forget. By the end of Dominique Pamplemousse I’d realised I’d smiled all the way through my time with it. There isn’t a character who is left without a story of their own to tell, several self-aware jokes about out-of-tune singing, and there’s even a little nod to Angela Lansbury. I caught up with Deirdra a few weeks ago to send congratulations on the IGF nominations, and to ask about the reactions of other people to the game. Deirdra’s influences include the interactive fiction master Emily Short, and of course the classic Lucasarts game Monkey Island. Deirdra also mentions vocal industry women Mattie Brice, Brenda Romero, Anna Anthropy and Courtney Stanton as an essential support network, “for being willing to speak up and be loud so those of us quieter, nerdier folks in the margins can be less afraid.” It seems important to Deirdra that the games industry be better at encouraging difference and welcoming new voices, so that more work like Dominique Pamplemousse can exist and flourish. This fall, Deirdra started working on an MFA in Digital Arts & New Media at UC Santa Cruz thanks to encouragement from friend Aaron Reed, and has several other game projects on the go. But first, there’s an awards ceremony to attend. Deirdra’s understandably overwhelmed by the nominations—four in total. But there’s one last unfulfilled wish: “My not-so-secret dream is to MC the awards ceremony one day. I’ve always wanted to host a major awards ceremony. If anyone knows how I can make this happen, I’d appreciate it.” Perhaps next year we could have an all-musical IGF Awards sung by the cast of Dominique Pamplemousse? It’s not all over until the claymation detective sings, you know. You can get hold of Dominique Pamplemousse’s irrepressible warbles via Deirdra’s website. It’s available on iPad, PC and Mac, and there’s a demo too, for your delectation. Cara Ellison lives in the UK and writes about games for places like The Guardian, Rock Paper Shotgun and PC Gamer.